Do you know where to go to enjoy a meal experience just for the adults in your group? Whether you're embarking upon a romantic getaway with your sweetheart, or are planning a couple's trip with friends, it's important that you are familiar with all of the local hot spots that are appropriate for adults. 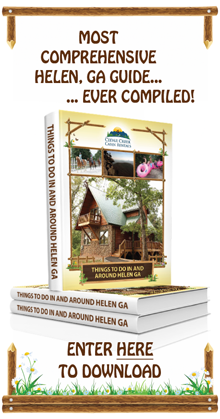 While Helen offers a wide range of family-friendly eateries, there are also plenty of restaurants located near our vacation cabins that will suit your needs and desires. Maybe you're craving a little bit of grown up fun, or perhaps you'd prefer a quiet and special dinner for two. Whatever you're looking for, we're here to help you find it. That's why we've put together this handy guide to introduce you to the very best adult-friendly restaurants right here in the heart of Helen. Get ready for a night to remember! Vacation is a time to let your hair down, kick back, and have some fun. If you're looking to experience a night out on the town, you'll definitely want to check out Paul's Steakhouse and its Viele Margarita Deck. No matter what time of the week that you decide to drop by, you'll be able to enjoy a full bar featuring some of Paul's own special cocktails (including Margaritas, Georgia Mountain Punch, and Chattahoochee Breeze), house wine, and a wide range of ice cold beers. Come by to enjoy a game, or for some live entertainment. Every Wednesday and Thursday, you'll be able to belt out your favorite tunes and become the star during Karaoke nights. If you prefer to sit back and watch, you might prefer to come by on Friday and Saturday to enjoy the music of live local bands. Regardless of when you visit, though, you're sure to have an amazing time. Sometimes you're in the mood for a more peaceful and intimate meal with the one that you love. There's no better place to have a special lunch or dinner than at Bernie's Restaurant in Sautee-Nacoochee. This charming eatery is located inside of a quaint country inn, but don't let that fool you. Although the beautiful, old inn offers a sense of warmth and simpler times, the restaurant offers a fine dining experience. Each meal is prepared by Monda, a graduate of the Culinary Institute of America. After 25 years of experience, the professional chef never ceases to impress guests with delectable soups, salads, entrees, and of course, desserts. If you're planning on coming to Helen to celebrate an anniversary, wedding, or other special event, Bernie's Restaurant is an ideal location. The establishment is well-known for its hospitality and ability to execute truly stunning events that you and your guests will never forget. 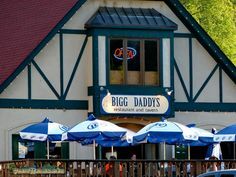 Another fun spot for a Happy Hour drink and nightlife is Bigg Daddy's Restaurant & Tavern. After a day of exploring Helen, it's always nice to kick back with new friends and old as you enjoy a refreshingly cold brew at the bar. Hang out with other fans as you catch the big game on one of the restaurant's big screen TV's, or stop by on the weekends to hear the sounds of some of the best local bands around - played live. You'll also find some really great weekly specials. Every Wednesday you'll be able to dig into 50 cent wings and wash 'em down with a $2 Yuenglings, and on Thursdays you can enjoy pizza and beer with a $4 8" personal pizza and a $1PBR. Would you like to enjoy dinner and a view? The Unicoi Restaurant at Unicoi State Park allows visitors to take in the breathtaking scenery of the northern Georgia mountains. 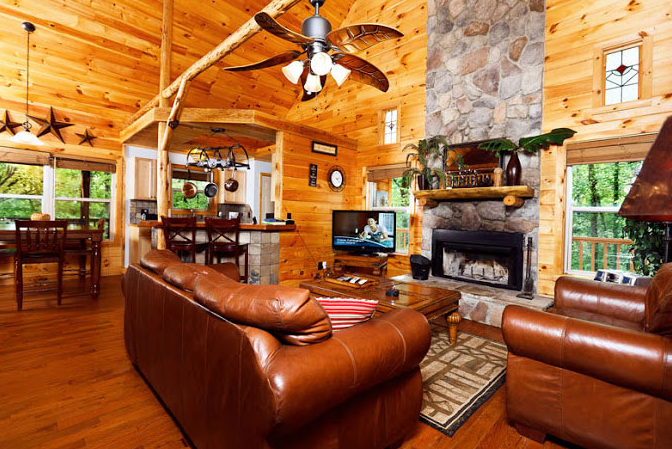 You'll be able to experience the freshest local trout, seafood, and other American cuisine inside of a cozy restaurant with high ceilings and a fireplace for romance and ambiance. This is an excellent place to take that special someone for a dining experience that will set the tone for your next romantic getaway. Last, but certainly not least, if you're visiting Helen, you've definitely got to make time to check out The Hayloft Tavern - the city's oldest pub. Enjoy all-American eats and ice cold beer while taking in the live entertainment. The restaurant hosts various Karaoke nights so you can show your loved ones what you've got, and live music on weekend evenings. Don't forget to stop by on Wednesday nights to take advantage of fifty cent jumbo wings! Would you like to learn more about any of these adult-friendly restaurants in Helen? Feel free to ask us any questions that you may have.